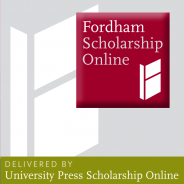 Fordham Scholarship Online (FSO) is delivered by University Press Scholarship Online (UPSO), a rapidly-expanding online research library, containing thousands of academic monographs in the humanities, social sciences, sciences, medicine, and law. What is the future of academic publishing? We’re celebrating University Press Week (8-14 November 2015) and Academic Book Week (9-16 November) with a series of blog posts on scholarly publishing from staff and partner presses. Today, Kate O’Brien-Nicholson of Fordham University Press discusses one of the great misconceptions about university press publishing. “Fordham professors write your books, right?” This is often less a question than an assumption and probably the biggest misconception about not just our, but all, university presses. Most people have heard the phrase “publish or perish”. They seem to visualize professors endlessly researching, churning out manuscripts, and ultimately presenting them to “their” presses for publication. Fordham professors do research and produce some wonderful books but more often than not they are published by other presses. This is the case for all legitimate university presses. Our mission is to further the values and traditions of Fordham University through the dissemination of scholarly research and ideas. These ideas can and do come in from some interesting sources. Take Cool: How Air Conditioning Changed Everything, one of our newer titles that is enjoying global success. Author Sal Basile is a longtime professional musician and singer with the St. Patrick’s cathedral choir. Medical doctor, Michael Good, was so passionate about relatively unknown German wartime hero, Karl Plagge, that he took on The Search for Major Plagge: The Nazi Who Saved Jews. Basile made the transition from music to wider social commentary; Good opened files that had been untouched for over fifty years and spent several years interviewing survivors, demonstrating that great scholars can come from unlikely places. One of the more familiar places for us is of course New York City, and many overlook the outstanding regional histories that university presses from New York to Hawaii publish. Whether it’s abandoned islands or the synagogues of the Lower East Side, we’ve been able to draw on the skills of not only local historians, but also professional photographers to record and present the city. Great works of scholarship can also look good on a coffee table. And to be sure, we don’t discriminate against professors from other universities. This season, one of our featured titles is Who Can Afford to Improvise? James Baldwin and Black Music, the Lyric and the Listeners, an insightful meditation on black music and culture and James Baldwin’s centrality to black music and culture. Author, Ed Pavlić, is a professor of English and Creative Writing at University of Georgia. Our authors come from inside and outside of academia – all over the world. Although we are extremely proud of the books that originate from within the Fordham community, there is no Fordham-biased nepotism in our offices. If your ideas have merit and your research is legitimate we want to talk about your book. Kate O’Brien-Nicholson is Marketing Director for Fordham University Press. Fordham University Press is distributed in North America by Oxford University Press USA and over 300 Fordham University Press books in subjects across the humanities, sciences, and social sciences are available on Fordham Scholarship Online.